Writing my opening letter of the school year, I quoted from Mark Twain's early piece Old Times on the Mississippi that originally appeared in, I think, The Atlantic Monthly. In reflecting on a reading of it long ago, I associated Twain's main character in Old Times with Tom Sawyer. However, I realize upon further reflection and research that it was in fact more autobiographical. The main character's identity is not so clear, but it's probably Twain himself. My apology for the error. Following is my opening Chapel Talk. 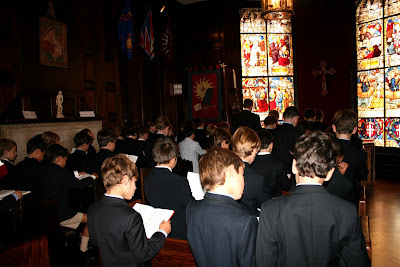 The talk, or some variation of it, was given to the boys in grades 3 through 8 during their regularly scheduled Chapel time today. Good morning, boys. Welcome back. Today, you are surrounded by newness. It is a new school year. You are in a new grade. You have new teachers, new homerooms, new sports teams, new pens, pencils, books and even, maybe new shoes. You may feel a little nervous, maybe a little excited. Maybe you feel anxious, even a little “unsure” because of all this newness. You know too, that more will be expected of you this year—by your teachers, your parents, and even by you yourself. There is much that may seem different, fresh, novel--new; but some things, if you look closely, haven’t changed. In fact, we can all take great comfort in the fact that some of the most important things haven’t changed at all. The mission of Saint David’s School can be found on the walls of our classrooms, in each and every publication of the school, and it hangs most prominently, in illuminated manuscript, in the school’s lobby. Surrounded by all this newness, the school’s mission is steadfast, consistent, reassuring and guiding. Our school-wide theme this year comes from the first line of our mission--rigorous pursuit. Rigorous doesn’t mean more or harder, rigid or stiff. Rigorous means working smarter--organized, thoughtful, deliberate and meaningful work. It means developing a plan, executing that plan and successfully accomplishing your goal. Accomplishing the goal, however will not always be easy. It may not happen on the first, second or even third attempt. It may take many attempts. It took Thomas Edison 2000 attempts to build the light bulb before he got it to work. And in chapel too. Well, not exactly in chapel, but in your moral and ethical conduct. Pursue this rigorously too. For us at Saint David’s the easiest way to think about the rigorous pursuit of the spiritual is to apply it to the Golden Rule—treat others as you would want to be treated. This is easy, right? Who doesn’t want to treated like “we” want to be treated? If I'm nice to him, he'll be nice to me. I will do to him, what he did to me. I will get him, before he gets me. We have a moral obligation to resist violence, remove barriers and resolve conflict. We have a moral mandate to seek and to seize each and every opportunity for peace and goodwill. If we rigorously pursue the Golden Rule, it really means that we will be honest to liars, fair to the unjust, and kind to callous people. We will be generous to the greedy, humble to the prideful, and forgiving of the wrong doer. Not because it’s to our advantage, which it may or may not be, but because it’s right. And because the way we treat others is more about who we are, not who they are. We cannot control the actions of others. We can only control the actions of ourselves. These are the virtues, respect and reverence, even in the face of hardship, that we want you to pursue rigorously this year—with your teachers, your parents, with strangers and most importantly with each other. ... Work smart. Work on. And how are you going to do this? Well, that’s not for me to say. It’s for each of you to decide. I wish you a successful and fulfilling year. *This vignette and the "higher" interpretation of the Golden Rule was adapted from Michael Josephson's Radio Talk # 730.5, Josephson Institute, July 7, 2011. I read and hear with greater frequency "the book is dying." We live in a time where instant information often drowns reason, gossip trumps news, and knowledge of the immediate defeats rigorous analysis, critical reflection, and eloquent debate; where the infotainment scoop often supersedes journalistic integrity. There have, without doubt, been many new conveniences and welcomed advantages with the advent of the Internet and all its offspring: Twitter, Facebook, wikis, blogs, nings, and list serves (remember those); but the value of thoughtfully conceived ideas fully reflected upon, critiqued and edited is without equal. As David Ulin puts it in The Lost Art of Reading – Why Books Matter in a Distracted Time: "Reading is an act of resistance in a landscape of distraction.... It requires us to pace ourselves. It returns us to a reckoning with time. In the midst of a book, we have no choice but to be patient, to take each thing in its moment, to let the narrative prevail. We regain the world by withdrawing from it just a little, by stepping back from the noise." Books provide an unparalleled opportunity to express, organize, develop, and communicate complex concepts and ideas. They encourage reflection, cultivate reason, and promote thoughtful discourse. The book's form may change, but its concept will live forever. It has to! High atop a hill overlooking the sea, a beautiful lighthouse illuminates the night, showing the way. It was built by the residents of a small hamlet, concerned by the number of shipwrecks witnessed and wayfarers who had lost their way. It was a prodigious lighthouse. As time passed though, the lighthouse’s beauty faded and the light went dark. Successive generations of hamletfolk, losing sight of their ancestors’ original intentions, ignored the lighthouse’s upkeep, disregarded its importance, and in an effort to satisfy a more selfish need, eventually converted it to a clubhouse. For institutions to be strong and vibrant they can never loose sight of their founding principles or true purpose. Institutions that do can easily become something far different than their founding intention. As Saint David’s passes the mid-point of its 60th anniversary year, we continue to illuminate and reflect upon our mission, critically evaluating its purpose and redefining its significance for today and for tomorrow. The last phrase of our school’s mission synthesizes the essence of our enterprise. To help our sons aspire “to be good men” requires that we provide models and examples. It necessitates active, deliberate, and purposeful application. More often than not, it demands that we be counter-cultural, or more specifically “counter pop-cultural,” because the prevailing popular culture may not always celebrate, reflect, or imbue the values and behaviors generally associated with what’s “good.” Development of a strong sense of what’s right, fair, or good comes in part by learning it, and to learn it we must study it, see it, and do it. Informed a little by the aesthetic, the latest issue of Saint David's Magazine explores the concept of being Agents for the Good. With the help of Jack Hale ’71, Michael Izquierdo’92, Father Katsouros, Oscar de la Renta, James Barbieri, Thomas Ryan, Brian Donnelly, John Dearie ’95, and RoseMarie Alfieri, it highlights some of the ways Saint David’s School illuminates its mission at the mid-point of its sixtieth anniversary year, ensuring that the light of this schoolhouse burns forever bright. 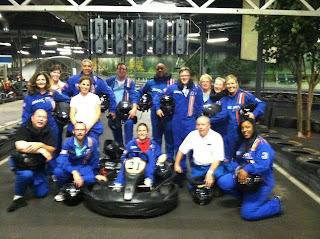 On a racetrack in the mountains of northern Westchester on Thursday, September 1st, 2011, the senior administrative team of Saint David's School, pursued a common goal. 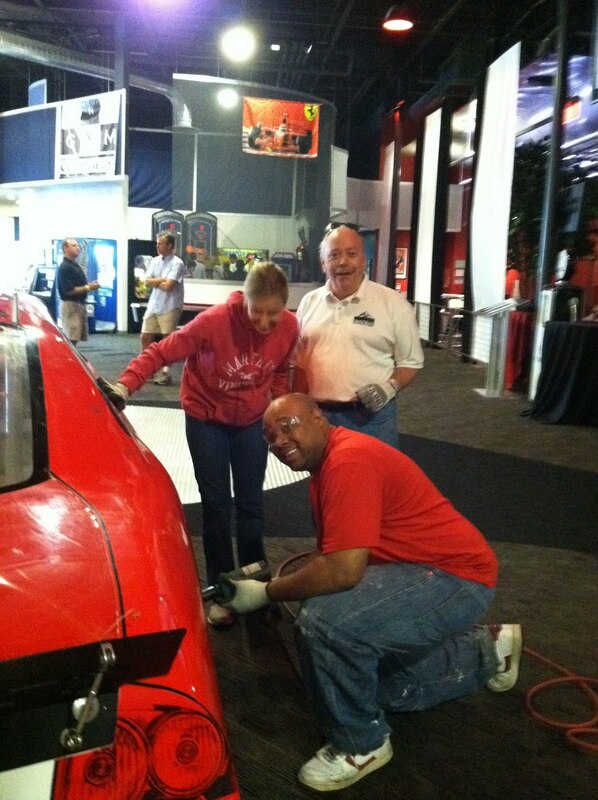 Working in teams of three, they learned the challenges of a NASCAR pit crew and the skill and endurance required of a race car driver. To successfully achieve the goals they established required, in addition to deliberate planning and flawless execution, a focused desire to overcome the many obstacles before them. 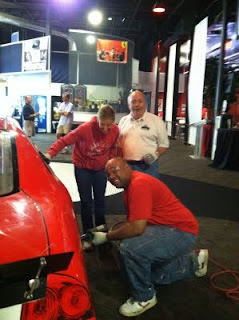 At left, Business Administrator Jack Sproule with Dean of Studies Ali Aoyama, and Director of After School Shadeed Elliot compete in the Pit Stop Challenge. The exercise, the leadership group's opening meeting of the school year, allowed the team to explore this year's school-wide theme of "rigorous pursuit." Like Dale Earnhardt, Jr., or the famous Australian race car driver Peter Brock, the administrators realized that to succeed they needed the combined talents of each of their team-mates in addition to a healthy dose of determination and strategy. At right, starting drivers from each team take their positions for the much anticipated start of the endurance race. Pictured with engines revving at a high squeal, poised to release their brakes and thunder down the straightaway are Dean of Faculty Shane Kinsella, in front, Registrar Sylvia Hopkins, Head of Lower School Kim Davidson, Plant Manager Mark Poelle, and Director of Athletics Pedro Morales. Pictured below is the administrative team at the race conclusion. Seated in the winning car representing the winning team is Director of Technology Nora Sundar. I you have a minute ask an administrator, Who became known as "Red Flag?" 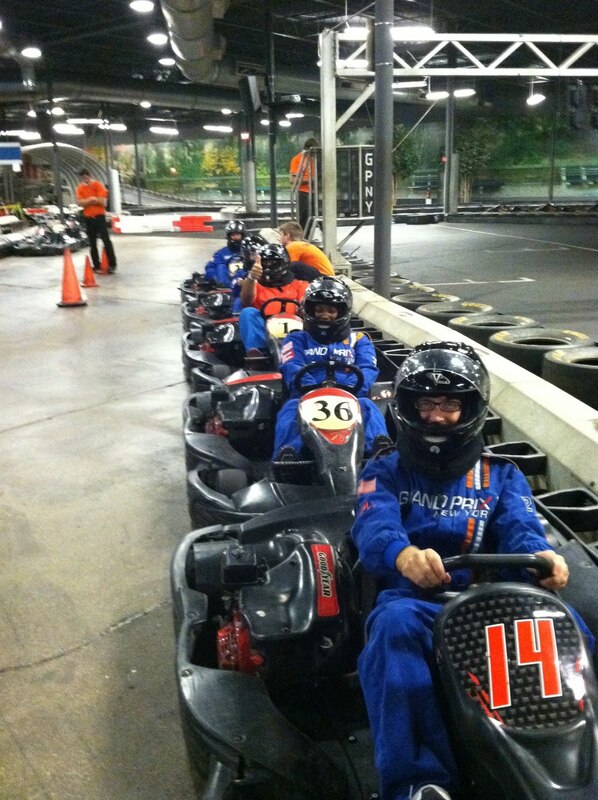 Who was fastest on the track? and, Who earned the nickname "Quick Draw" because of their incredible facility with the air gun? This journey to successful achievement is rarely easy; it is often fraught with frustration and confusion. Unhappiness can often muddy the road forward, slowing down our progress, trying our patience, and testing our will. These inevitable setbacks must not deter us; they must become the lessons of our curricula—the teachings gleaned from our experiences. “The will,” Muhammed Ali told us, “must be stronger than the skill.” Learning to work through and overcome hardship or struggle is synonymous with rigorous pursuit and what follows this, is the sine qua non of true learning. In its opening sentence, our school’s mission identifies “rigorous academic pursuit” not only as a value to be cherished, but a behavior to be learned. The “rigor” we refer to focuses not on strictness and severity, but rather on deliberate, thoughtful, and persistent pursuit. Whether it’s light bulbs, boxing crowns or academic achievement, successfully acquiring what we desire or value depends upon how rigorously we pursue it. This year’s calendar takes this notion from our school’s mission and explores its myriad application to the boys’ experience at Saint David’s School. As T.S. Eliot reminds us in this letter’s opening quote, it is precisely because of this purposeful pursuit that deeper learning occurs.